PUBLIC SAFETY Location-Based Services run the gamit from wireless Enhanced E911 (E911) to Next Generation 911 to leveraging the latest technologies for outside-the-box security applications. Look for this to get even more "exciting" (both positively and negative) as new technologies come online. A tiny space startup is striving to demonstrate the feasibility of transmitting data—and eventually perhaps voice messages—directly from small satellites in orbit to regular cellphones on the ground. The goal has enticed but eluded scientists and engineers for decades. If successful, such connections could help provide easy, low-cost access to the internet for developing and remote regions. 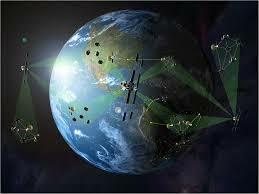 Various companies already market or plan to offer broadband-via-satellite services to precisely such areas. But those ventures typically require users to rely on antennas, ground stations or other types of additional terrestrial equipment that add costs and often increase complexity. At a conference in Barcelona on Sunday, Charles Miller, a former Trump administration space adviser and chief executive of Virginia-based UbiquitiLink Inc., is scheduled to unveil preliminary test results connecting signals from a roughly 16–pound prototype “orbital cell tower” to a cellular device in New Zealand and later in the Falkland Islands. ...If future tests bear out the preliminary and partial results, UbiquitiLink seeks to start deploying satellites weighing some 50 pounds each by 2020 or 2021. Initial applications could include tracking vehicles, providing access to emergency services or offering individual phone users limited internet connectivity—possibly just a few minutes daily when part of a limited satellite constellation passes overhead. Analysis: This article doesn't discuss a major concern to Public Safety (Law Enforcement) providers - How to prove a criminal's location after-the-fact. While there are ways of getting an accurate (e.g. GPS) "active" location (for crimes in progress), this is done relatively infrequently. Much more often, in a prosecution (often months after the committing of a crime) law enforcement uses "CDRs" (Call Detail Records) that show what cell tower(s) an accused criminal was connected to at the time of a crime to establish that they were at least in the vicinity.